Nestled among towering forest-cloaked mountains on the West Coast of British Columbia's Vancouver Island, Zeballos sits at the head of Zeballos Inlet, gateway to Nootka Sound, world-famous for salmon fishing and kayaking opportunities. The inlet was named by Captain Alejandro Malaspina in 1792 after one of his lieutenants, Ciriaco Cevallos. The discovery of gold in Zeballos in the 1920's resulted in a massive influx of miners and adventurers. The historic buildings in the village are a living reminder of those frontier days. (78 kms -- 55 mins). Turn Right at Zeballos Junction and follow the directional signs. Turn Left at Zeballos Junction and follow the directional signs. Putting in at Zeballos is easy, with a cement, all-tide launch ramp. Adjacent floats provide moorage for transient as well as resident boaters. A harbour manager looks after the moorage on a daily basis. The village is fast becoming a favourite destination for kayakers, sportsfishers and nature lovers who want to leave the crowds behind and experience the wild west coast of Vancouver Island. Comfortable accommodation and several cafes welcome visitors. 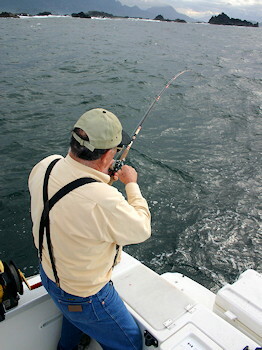 Tour the waters aboard your own vessel or arrange for an excursion with a local charter guide. Those with more time may want to arrive as a passenger on the M.V.Uchuck III, a working freight ship. The Uchuck sails weekly during the summer months from Gold River to Zeballos, with stops along the way at Tahsis and Friendly Cove. In April and May, bears are a common sight on the forestry road leading in to Zeballos. Elk are occasionally seen along the road. In the woods around Zeballos are deer, bears, cougars, elk, marten, squirrels, raccoons, beavers and river otters. During salmon spawning season in the fall, the river teems with fish. Bears and eagles that arrive to partake of the annual feast can be watched safely from the Sugarloaf Bridge. Trumpeter swans drift down the river, competing with the seagulls for newly laid salmon eggs. With the river running through the center of the village there's not much need for a nature channel on TV. Charter a boat in the spring to catch a glimpse of the grey whales passing by Nootka Island on their annual migration north. 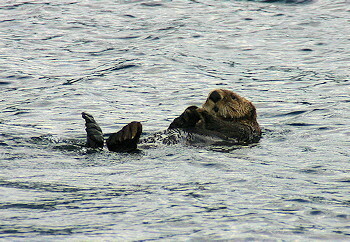 Rafts of sea otters can be seen throughout the year. For the more adventurous, Rugged Mountain and the Slab in the Nomash River valley are well-known to rock-climbing enthusiasts. Some of the best cold water diving on Vancouver Island can be found just a short boat ride away from Zeballos. The waters are especially clear in the winter months. Colorful anemones sway in the currents while Puget Sound king crab scuttle below. Purple hinged scallops, soft corals and abalone cling to the rocks. Curious six gill sharks glide past in the clear waters. 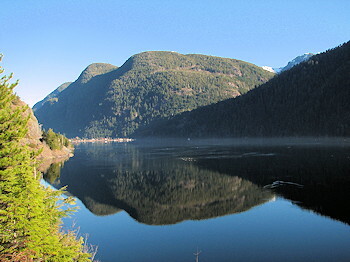 The steep walls of Zeballos Inlet and Kyuquot Sound provide for exceptional wall dives. 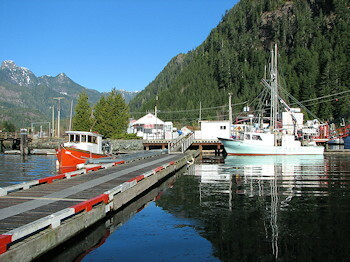 Tahsis Narrows and the Gardens are well known local diving sites. Local Information: There is no actual visitor info centre. In the summer time, people come to the museum for local info and for the rest of the year they stop at the Village Office.